The Sydney Morning Herald reports that the cruise ship Queen Victoria is going to "turn pink" while in Sydney Harbour, in support of breast cancer research. The Queen Victoria, owned by Cunard line, is one of the world's largest cruise ships. "The liner will visit the harbour on Friday, playing host to the National Breast Cancer Foundation's (NBCF) launch of its 2010 fundraising campaign that night. Cunard, which owns the ship, says the Queen Victoria will be covered in pink lights from dusk on Friday, making for a spectacular sight on Circular Quay." Read the story at SMH.Com.au. The same article says that Royal Caribbean Cruises is planning to double its presence in Australia, sending 30 ships to Sydney Harbour over 2011 and 2012, and bringing 30,000 tourists to Australia. 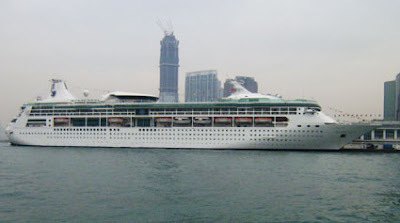 Two large superliners - Radiance of the Seas and Rhapsody of the Seas will be permanently based in Sydney from October 2011. If it's cruises from Sydney you're after check out the deals at www.cruisesalefinder.com.au. Right now you can save up to 15% off fares aboard Rhapsody of the Seas, sailing 26 February from Sydney to Fremantle. Ports of call include Brisbane, Hamilton Island, Cairns, Port Moresby, Darwin, Broome and Exmouth.